Lovingly renovated over the years, our unique guestrooms can accommodate anything from a single business traveler to a family of four. Each of our rooms and suites come equipped with a flat screen TV, mini refrigerator, fireplace, robe, coffee/tea station, and other useful amenities. We hope our large comfortable beds, festive fireplaces, and seasonal room-serviced breakfasts will remind you of the comforts of home. We feel strongly that all our guests should receive the same level of cleanliness and service. To that end, we simply cannot guarantee early check-in. However, when possible, special requests will be entertained on a first-come, first-served basis. Should you arrive unexpectedly early in Morro Bay, you are always welcome to park your car in our lot and stroll through our lovely Old Town, Embarcadero, and beaches! Late check-out is usually available with notice. We are too small to keep a 24-hour staff, however, so please be considerate and ask the front desk ASAP so that housekeeping can make arrangements. Morro Bay, California is a fishing village located along Highway 1, south of Big Sur, midway between Monterey and Santa Barbara. Known for its estuary, state park, Morro Rock, Morro Strand, bird watching, whale watching, and of course seafood, there is plenty for guests to do when visiting. 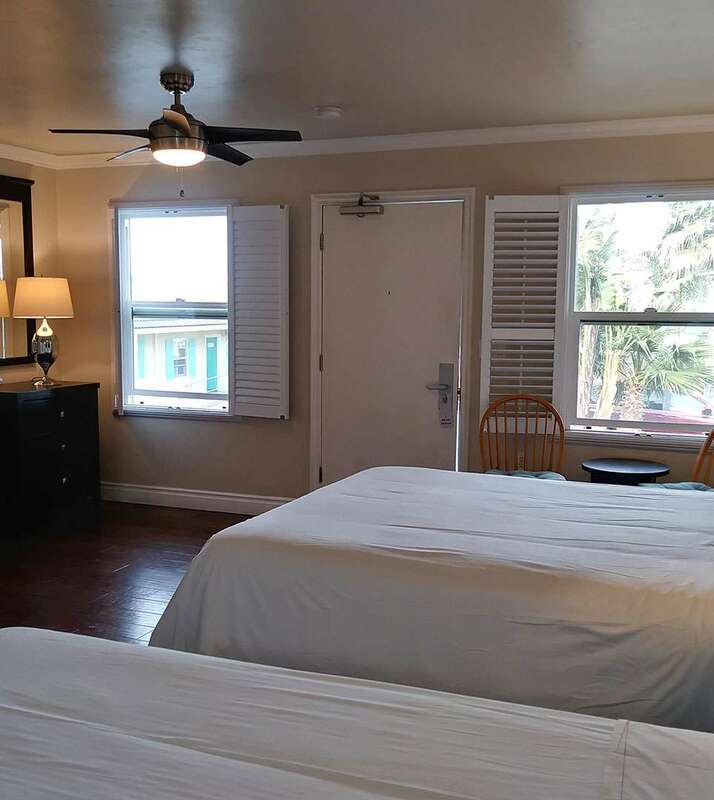 We invite you to test your surfing skills at Morro Strand State Beach, go hiking at Morro Bay State Park, or experience the sea life on a bay cruise while you visit us at the Beach Bungalow Inn & Suites. We offer complimentary guest parking to our registered guests. Complimentary wireless internet is available to our guest throughout our property. All rack rates are for double occupancy. All extra people *up to a total of 3 people per room, or 4 people per suite* in existing beds, are subject to a charge of $30/night. Rollaways may be available, for $30/night. Please call ahead for availability. In extenuating circumstances, we may allow a 5th person in a suite, for a charge of $50/night. Call ahead if you need to accommodate a larger party. The pet fee is $30/night per pet, with a maximum of 2 dogs/room. Please be advised: not all rooms are pet friendly! Not all rooms can comfortably accommodate 2 larger dogs! Please pick up after your dog. Bags are available at the front office. Some of our guests have allergies to pets. Our Hypoallergenic Rooms are reserved for them, and a cleaning fee of at least $200 will be charged if a pet is allowed to enter those rooms. We can guarantee neither a pet-friendly nor a hypoallergenic room unless you contact us prior to booking. Please note that ADA Defined Pets are welcome at our hotel at no additional cost.